Church Communication must be broken. Thousands of churches are closing every year; only 1 in 5 are growing, and it’s estimated that 3500 people abandon church DAILY. 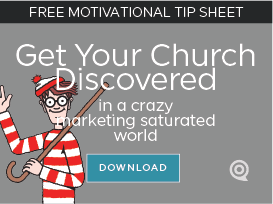 Only a small amount of churches seem to be working, so church communication must be a secret. Have you ever watched one of those viral videos with clever hacks for everyday problems? I’m drawn to them, and every time I watch one, I learn something new. What causes this life-changing attraction? The formula is the same as the memorable TV infomercials: Emphasize the pain that many have by making it sound like there’s no hope for the average person. Then, with simple tools or ingredients, demonstrate a surprisingly easy solution. The secret behind hacks and infomercials? Someone identifies the prominent problem within a particular audience, creates a compelling story that most will associate with, and then when the heightened interest is achieved, cleverly launch the solution. Then they create a way to ensure the story will be discovered and shared. Church should be like this. We have THE simple Solution for all of mankind’s problems. It shouldn’t be a secret! Why doesn’t the community know it? The church isn’t sharing our life-changing stories. Most won’t listen to preaching, Bible verses, or anything spiritual. But they love compelling stories. Church communication stories seems so easy, but we’re not doing it. The Bible demonstrates it well. It’s a collection of stories that emphasize common pains and needs. The people who follow after God are successful while the ungodly ultimately fail. In the New Testament, Jesus offers a surprisingly simple solution over complex religion. Yet, our communities hear us offering complex religion. We’ve often created church services that are laboriously, in-depth, scholarly, educational presentations that (even for the committed follower) are not compelling or practical. The average person only remembers a small amount of the information. It’s hard to share what you can’t remember. A good church communicator is compelling, surprising, interesting, shareable. Even a complex doctrine can be told in a way that people understand it. Then the Holy Spirit will use those stories to pull people to Him. As Church Communicators let’s become the interpreter of all the things happening in our churches. And tell amazing life-changing stories. They’re everywhere.